Plan your next trip with Charter Everything and get the most trusted and reliable charter bus service in Kentucky. With an excellent track record of more than 25 years, we offer our customers complete satisfaction through our transportation services. We add value to your journey with us by making it comfortable and hassle-free. We have an exclusive range of bus options in our dynamic fleet. You can choose the option that suits the best as per your requirements. As the leading charter bus rental company in Kentucky, we make sure to assist you throughout the journey in the best possible ways. We deliver top quality services throughout the year. We are available for all types of events and occasions. We follow proper safety guidelines and security standards in our vehicles. We assure to serve our customers in an exceptional manner. If you are planning for a sightseeing trip to Kentucky, do not worry about transportation as we will take care of it. Hire a bus from Charter Everything to have an enjoyable and comfortable ride. 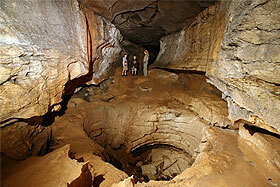 Explore the most beautiful tourist attractions in Kentucky with our top class charter buses. Experience the thrill of horse racing at Kentucky Derby. Witness the history of baseball in Kentucky by visiting Louisville Slugger Museum & Factory. Embark on your journey with our luxurious Kentucky charter buses. Embrace the beauty of nature at Daniel Boone National Forest. Get the best experience at Cumberland Gap National Historical Park and get a scenic view of the hills. Pay a visit to Abraham Lincoln Birthplace National Historic Park in our charter buses to know about the wonderful history of the place. Stay relaxed and stress-free about transportation when you need to go to occasions like a wedding with your family and friends. Charter Everything provides efficient traveling solutions for taking your guests to the place of the wedding. 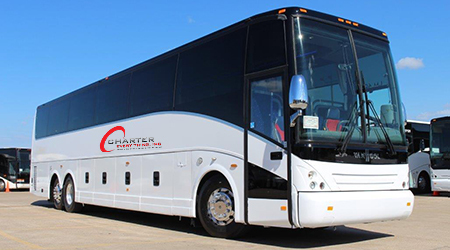 We ensure to provide all the luxurious facilities in our Kentucky charter buses. Choose one of our deluxe charter buses and travel to your wedding destination in a stylish manner. We offer you the most comfortable traveling experience throughout the journey. If you are worried about the hustle of transportation for your corporate tours, sit back and relax as we have everything covered for you. We understand the needs of corporate employees and fulfill them in the best possible ways through our charter bus rental services. Get in touch with our team of travel experts to plan out your corporate tour and get top class traveling experience in our charter buses. We have a great variety of buses in our fleet with flexible seating capacity suitable for groups of all sizes. Our vehicles can accommodate groups ranging from 10-61 people. If you have a large group, our deluxe motorcoaches with a seating capacity of 61 passengers can be the ideal option for you. Our minibus rentals can accommodate up to 38 people. We also have sprinter vans for small group sizes up to 15 people. Our buses are equipped with advanced features like AC & heating system, sanitized restrooms, high-quality audio & video system, charging & power outlets, internet Wi-Fi, spacious compartments for storing luggage, and reclining seats for absolute comfort. Select the bus of your choice from our exclusive fleet and get the best transportation services. Enjoy the local events and festivals of Kentucky in an exciting way without having to worry about the transportation. 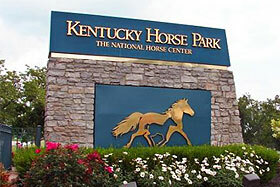 Get a fascinating experience of horse racing at Kentucky Derby Festival, the largest annual event in Kentucky. Experience the thrill with joy at Kentucky State Fair in Louisville. Meet exciting people and learn about their culture and tradition at the Kentucky Bluegrass Music & Burgoo Festival. We consider the safety of our passengers as our topmost priority. We provide the most reliable and secure charter bus rental services in Kentucky. Our professional drivers are certified and licensed with years of experience. All our vehicles are insured and properly maintained for excellent service. 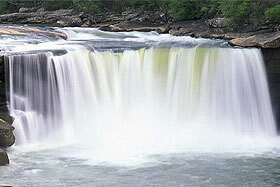 We assure to make your trip to Kentucky memorable and delightful. Kentucky is not only popular for its horse farms and bluegrass fields, but it is also known for its exciting nightlife. Get an unforgettable experience of Kentucky’s nightlife by hiring a private party bus from Charter Everything. Enjoy live music concerts & engage yourself in the piano bars & dance clubs. Travel with style and comfort while enjoying the best of Kentucky after the sunset. Our private party buses are designed to give you the most amazing party experience. With a seating capacity of 18 to 40 people, our buses have all the amenities and features like black tinted windows, moonroof & sunroof, wet bar, internet Wi-Fi, comfy leather seats, fiber optic & neon lighting, surround sound system, power outlets, and plasma TV screen. We offer the best quality services in our party buses at affordable prices. If you are a fan of sports, go out to support your team and attend the sporting events with your group of friends. Hire our charter buses and keep up the excitement for the event throughout the journey to the stadium or sports arena. Feel comfortable while traveling as you don’t have to worry about parking your vehicle or getting late for the event. Our drivers will be at your place to pick you right on time so that you do not miss any part of the event. What Makes Charter Everything Different From Others? We are the leaders in the field of transportation. We are proud to be the top charter bus rental company in Kentucky. We are committed to providing premium services with unmatched quality. Exclusive Range of Buses: We have a huge variety of buses in our vast and dynamic fleet. All our buses are equipped with the best facilities and comfort. We have vehicles suitable for group sizes of 10-61 people. High Safety Standards: Our vehicles are completely safe and insured. Our chauffeurs are professionally trained and licensed to make sure that you are in safe hands while you travel with us. 24×7 Client Support: Our team of travel experts is available 24×7 to guide you with choosing the best travel package suitable for your needs. Affordable Prices: We offer our services at the most economical prices in the market. We assure to provide you with the best quote for your selected travel package.